Sesame Street is a popular long-running television program geared towards children. It is an educational show and I am personally interested in the program and characters for the powerful nostalgia. Sesame Street served not only as a didactic platform, but also as entertainment (and, simply put, fun times!!). I had fun working on other paintings of this series, including characters such as the Count (a sort of re-configuration of Dracula) and Miss Piggy. One of the Count’s main goal is to teach children how to count. 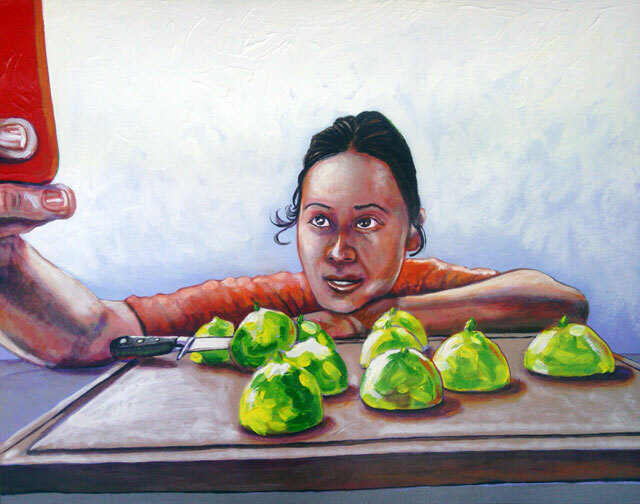 This page involves a “hybridized”, cross-cultural, multi-generational exploration involving the Mexican Loteria and Sesame Street characters, along with my perpetual fascination, critique and celebration of our dependence on tech-toys and gadgets. I find myself being inspired by the iconic, classic characters created by the Mexican writer and actor Roberto Gómez Bolaños. 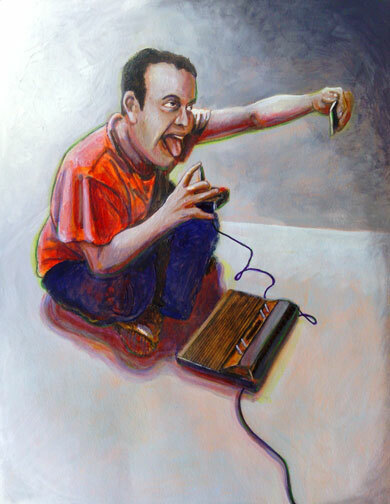 In 2012, I decided to paint “El Chapulin Colorado”, but with a twist (with the face of Barack Obama), suggesting that even the president of the United States is a fan of the Latino (somewhat goofy) underdog and hero of the working class for Spanish-Speaking countries (as well, perhaps, as for countries that feature and translate these television and on-line programs). For the painting “app 2 gain Latino fans 2”, I decided to visit “El Chavo Del Ocho” but, again, with a twist… this time, I decided to put onto the face the grinning expression of Hillary Rodham Clinton as a sort of hero for the everyday person. Movie featuring Gabriel Navar’s newest series of paintings dealing with the selfie phenomena. 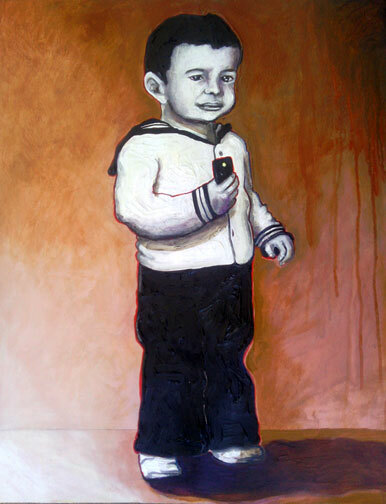 Subjects include individuals taking pictures of themselves with their smart phones. Included is big papi, David Ortiz, taking a selfie with US President Barack Obama. The background music is “Happy” by Pharrell Williams. Shouldn’t we be happy when taking a selfie? 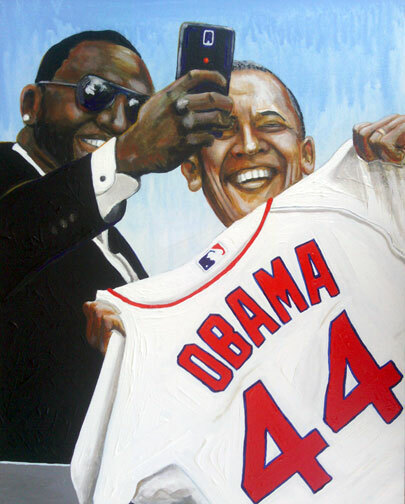 The notoriety of this Ortiz, “el papi” and US President Barack Obama “selfie” captivated my creative imagination… mostly because I am a fan of baseball, Obama, and am intrigued by the ubiquitous “selfie” phenomenon.